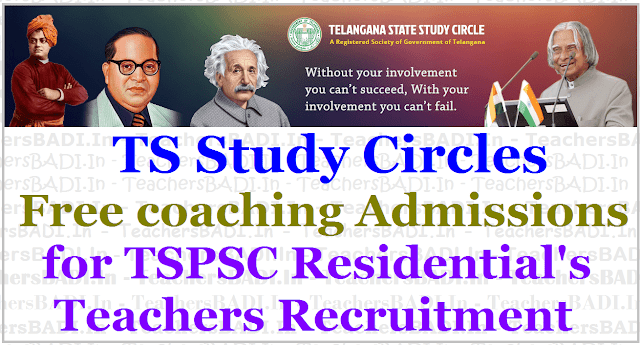 TS Study Circle Free Coaching for TSPSC Residential Teachers Recruitment 2017, TS Study Circle Free Coaching for TSPSC Gurukul Teachers Recruitment 2017, Telangana Study Circle Free Coaching for TSPSC Residential Teachers Recruitment to SC,ST,BC Minority Students, TS Study Circle Free Coaching Programme for competitive exams, #FreeCoaching Programme Admissions 2017 for Warangal, Karimanagar, Mahabubnagar, Nizamabad Study circles: Telangana State Study Circle has decided to impart Free Coaching for Preliminary (screening test) examination for Residential Teachers Recruitment to SC,ST,BC Minority Students in the 10 Districts TS Study Circles/centers. 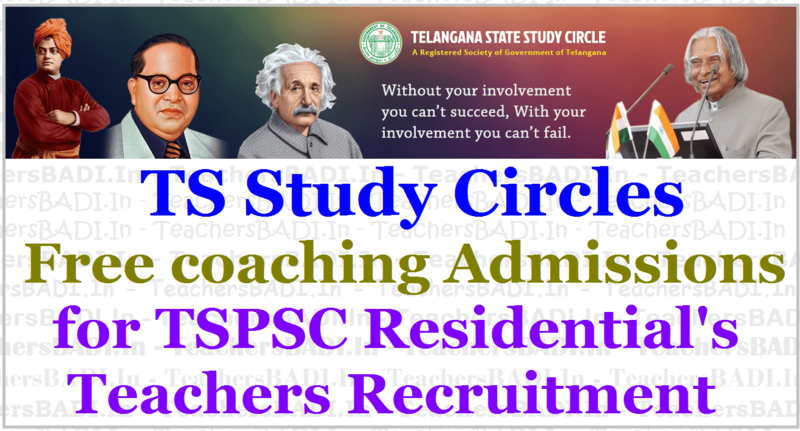 TSStudyCircle is going to release the Free Coaching admission notification for TSPSC Residential Teachers Recruitment 2017 and TS Study Circles would invite the online application forms from eligible SC, ST, OBC and Minority candidates belonging to Telangna State for admission into Free Coaching programme for TSPSC Gurukul Teachers Recruitment 2017. The coaching programme will be for five months and it is a full Residential programme / some of the seats may be allotted to other Telangana Districts. Telangana State Public Service Commission (TSPSC) had published Notification for Residential School Teachers’ Recruitment. Total No of vacancies as Notified by TSPSC are 7306 under various categories. Out of which 2136 vacancies for TSW Residential Schools, 307 vacancies for TSRS Schools, 1789 vacancies for MJPT BC Residential Schools, 994 TW Residential Schools and 2080 Vacancies for TS Minority Residential Schools. SCs and STs and Rs.1.00 lakh for OBCs / Minorities. 2. Aspirants should not be employed or be pursuing any other courses in any educational institutions during 2016-17 since this is a full-time residential course. 3. Aspirants should not have availed any similar coaching sponsored by the Government. elsewhere. 4. Aspirants should have completed their Graduation courses. 5. Aspirants should also be eligible as per the norms like age etc. prescribed by the organizations like UPSC / TSPSC or Banking Services etc. 1. Admission is through entrance examination which is in the objective question paper, as per the General Studies syllabus of the Banking Services. The applicants can send their handwritten or typed applications with details of Name, Father's name, Full Postal address with Pincode of the place of residence, Mobile Number, email I.D., Qualification and enclose the attested copies of caste, nativity, SSC, Degree marks lists and latest income certificate (2015-16). So, Aspirants are advised to send their applications either by post (or) in hand, to the Deputy Director, SCD Dept, Warangal. 1. Self-addressed envelope with sufficient postage (Rs.5/-) stamps should be enclosed for sending hall tickets. 2. Candidates should enclose 2 photographs (passport size) with his / her signature attested by a gazetted officer. 4. A copy of SSC, Inter, Degree/ Professional Degree/ PG Certificates. 6. Bonafide Certificates from Class IVth to Class X. 5. Marks memo of B.Ed. 8. Disability certificate in case of disabled candidates.